Caterpillar Host Plants: Luvunga crassifolia (Rutaceae), Luvunga scandens (Rutaceae), Melicope lunu-ankenda (Rutaceae). A male Banded Swallowtail resting at a leaf perch. 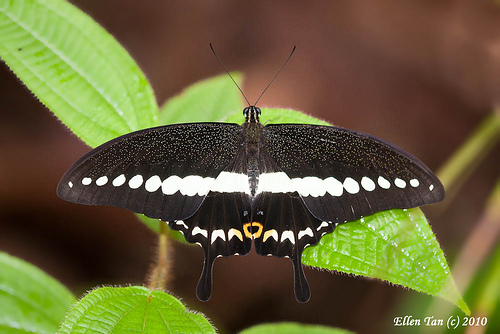 A female Banded Swallowtail resting at a leaf perch. 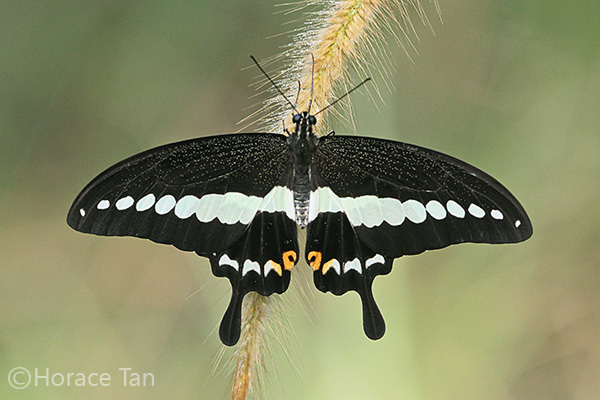 Partial upperside views of the Banded Swallowtail showing one key difference (circled) between the two sexes. Above, both sexes are black with a macular band of pale greenish spots extending from the forewing apex to the hindwing's mid-dorsum. The hindwing has a series of submarginal pale greenish lunules and a black tornal spot embedded in a much larger orange spot. The female has the inner half of the lunule in space 2 further coloured in orange (see above pic). Underneath, both sexes are similar with the macular band and submarginal lunules in the hindwing much broader and the area between them subdivided into two series of black spots by patches of orange and bluish-green scales. 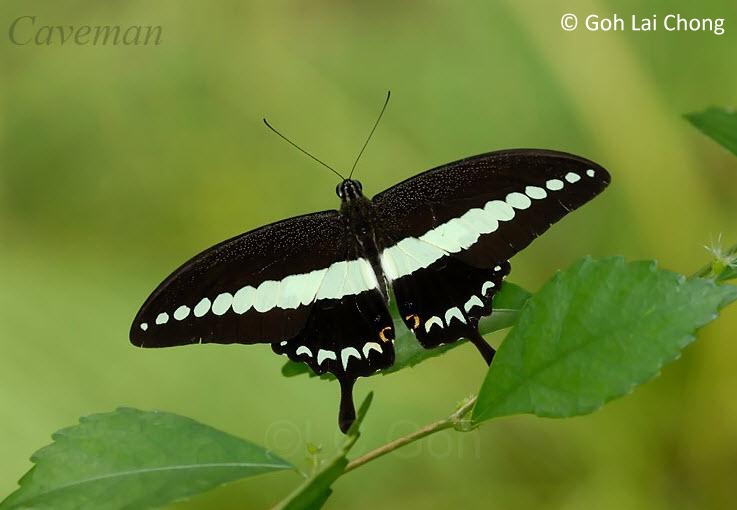 There is a moderately long spatulate black tail at end of vein 4 in the hindwing. Mirroring the difference in the hindwing upperside, the female has half of the submarginal lunule in space 2 coloured orange (see highlight A in below pic). The sinusoidal marginal black band is continuous in spaces 6 and 7 in the male, but broken in the female (see highlight B in below pic). 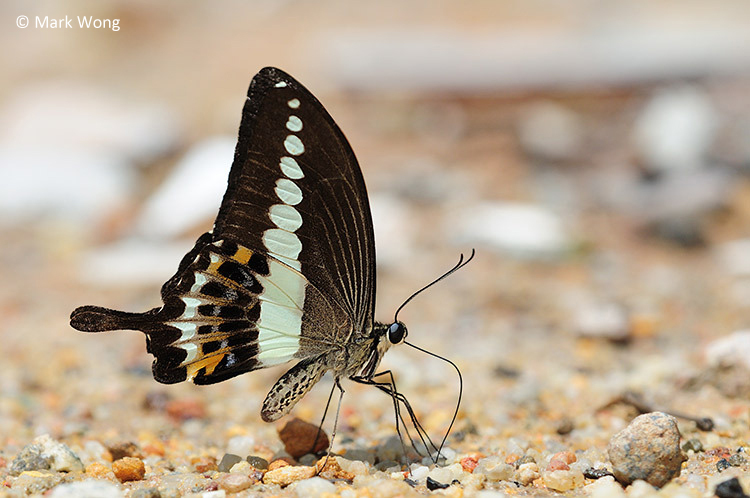 Partial underside views of the Banded Swallowtail showing two key differences (circled, marked A, B) between the two sexes. 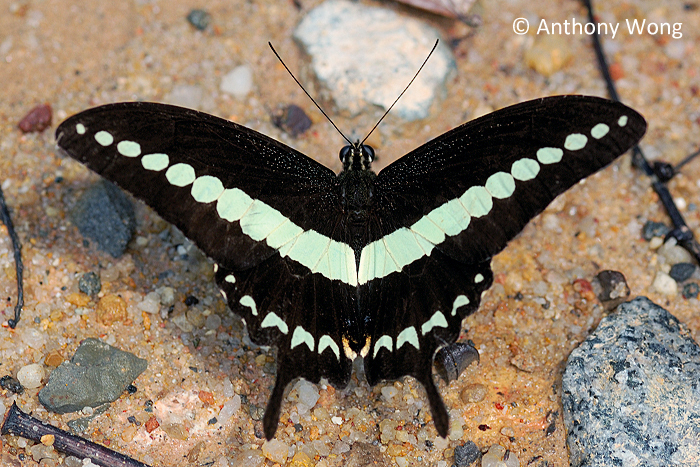 A male Banded Swallowtail puddling on wet ground. 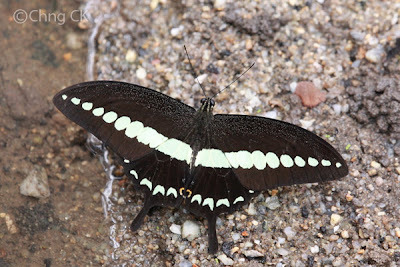 A puddling male Banded Swallowtail. Another puddling male Banded Swallowtail. Banded Swallowtail is moderately common in Singapore. The adults can be found in the nature reserves, wastelands, mangrove habitats and in offshore islands like Pulau Ubin and Pulau Tekong. The fast flying adults are frequently seen in flights along trails/tracks and while making occassional stops to visiting flowers growing in the surrounding vegetation. During cooler hours in early morning and late afternoon, adults could be found resting on leaf perches in an open wing manner. The males have been observed to puddle on wet grounds.